The Yoga Collective is an online library of more than 150 high-quality yoga videos that users can tap into anywhere they have an internet connection. I have gifted a membership to check out the site and see for myself why The Yoga Collective is such a great resource for people who want to work on their practice at home, take it with them on vacation, or just explore a new pose. Classes cover a wide spectrum of styles, from the restorative flow and yin/yang yoga to power yoga and inversion practice. They even have short sequences dedicated to breathing, meditation, ab work, and hip openers (what I need – ouch!). Users can choose from classes that last 10, 20, 30, 40, or 60 minutes. Yoga classes are offered at five different levels ranging from introductory to advanced. There’s also a pose library with short instructional videos to walk beginners through some of the most frequently used positions. Memberships are $12/month or $130/year and The Yoga Collective donates half of that money to charity. The Yoga Collective is also a brick and mortar studio located in Venice Beach California. Each of the classes offered online is filmed in their bright and sunny space, using a variety of different camera angles to make sure you can see the poses and instructor throughout. 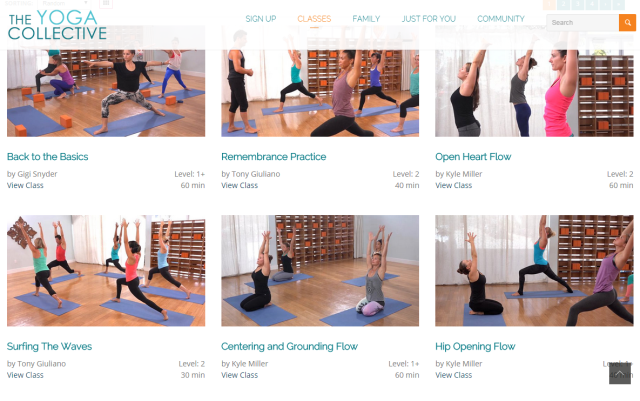 The Yoga Collective also updates the library with new videos as they are filmed, so don’t fret if you make it through all 150 classes – there’s more coming for you! What I like about the videos is that they are shot in a way that makes you feel like you are in the studio as one of the students. You’re not just looking at the instructor against a background, you’re watching a live online yoga class in action from a student’s perspective. Something a little new and different, in my opinion. It’s also helpful to see form modifications and corrections are done on a student to remind myself that I need to square my hips, straighten my leg, or turn my head the other way. As I increase my mileage while training for the Brooklyn Half Marathon, I’ve been trying to sneak in a little bit of yoga before work a few times a week, and the 10 and 20-minute videos are absolutely perfect for that. On high energy days I opt for a vigorous quickie flow, and other days I tap into a 10 minute guided meditation. There are also a few videos I’ve found that offer great post-run hip opening sequences – something I hate doing but know is so important to recovery! The library also has 60-minute classes, but to be honest my attention span hasn’t gotten to those yet. I’ve reviewed the videos and they look really good, so I’ll have to set aside some time soon. There’s a “CrossTrain 60” class and also a “Power Yoga Sweat Fest” that I have my eye on. And now, for a fun surprise! The Yoga Collective has generously given The Fit Crasher two-year-long memberships to raffle off to two lucky readers. Use the widget below to sign up for the drawing. The raffle ends Friday at midnight and the winners will be notified by email. Good luck!